The Flory-Huggins χ (chi) parameter is key to many polymer properties, as you can see in the Polymer Physics section. Here we see how χ relates to KB. In particular we see what happens to the polymer as we pass through the critical region around χ=0.5 when the system phase separates. Clearly the Gij values depend on χ, but, as stressed in other apps, Excluded Volume effects also play a big role, which is why polymer MWt is so important. Although the app is of no direct use, I have found it has greatly helped me grasp what is going on when polymers approach phase separation. Hopefully a few keen explorers will enjoy using the app as much as I have done! To get started, simply slide the χa slider. This is the χ value, assumed to be concentration independent. The other two χ values are for those who know that their χ is concentration dependent. Then start exploring the effects of MWt (or MVol as used here). Many polymer scientists are familiar with the Flory-Huggins χ (chi) parameter (which captures the dis-similarity between solvent and polymer) and the fact that when it reaches a value of 0.5 the solvent and polymer separate into two phases: a solvent phase containing a (low) saturated concentration of polymer and a polymer phase containing lots of solvent. This split into two phases is called the spinodal point. An app showing the classic Flory-Huggins calculation is based on standard lattice theory with its mixture of entropic and enthalpic effects. The only inputs required are the MVols, V1 and V2 of the solvent and polymer, and the χ parameter which is specified as χ = a + bφ + cφ2. The standard assumption is that b and c are zero, i.e. a constant χ but some real-world examples with different b and c are discussed below. For the Gij values, self-liking should give a positive value and dis-liking gives a negative value. However, the large size of the polymer means that it excludes solvent from itself and excludes itself even more, so even when the polymer is happy with itself and the solvent, G22 remains strongly negative. Excluded volume effects, which are usually not taken into account because they seem so dull, are of super-importance! The theory behind the app is described below. But the key is to see what happens to the chemical potential μ2 as you approach then exceed χ=0.5. It becomes rather obvious that bad things happen at that point. The Gij graphs show the whole range of volume fraction φ2 but the chemical potential graph covers a smaller range to show the interesting bits. The theory comes from an excellent paper by Dr Arturo Horta at UNED in Madrid. I have simplified the nomenclature for ease of reading on the web. Where i=1 for solvent and 2 for polymer, for volume fractions φi, molar volumes Vi and ratio r=V2/V1,the starting point is the link between the chi parameter and the zero angle scattering factor, S.
And with some minor arithmetic that becomes δμ2/δφ2 from which μ2 can be calculated and becomes unstable once we hit the spinodal point. Technically, KB cannot handle such a phase separation so the numbers in this region are not significant - it is the trend that is important. The formulae are rather easy, but what do they mean and why do things go wrong when χ reaches 0.5? The key is the balance between G22 and G12. G12 doesn't do anything very interesting, it is G22 which changes rapidly as χ exceed 0.5. This is because the polymer becomes balanced between two phenomena - the large negative value from the excluded volume effect and the desire to escape from the solvent which is especially large when there is little polymer and much solvent. You can see how G22 starts to curve up as things start to go wrong, and can see how G22-G12 becomes positive at the spinodal. 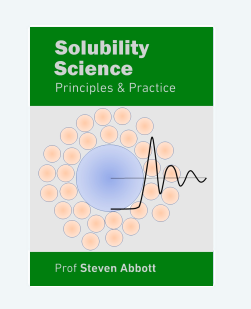 This approach to understanding the spinodal phase separation of polymers in bad solvents seems to me to be much more powerful and intuitive than the one we have all been taught which has some entropic and enthalpic effects in some lattice approximation to reality.